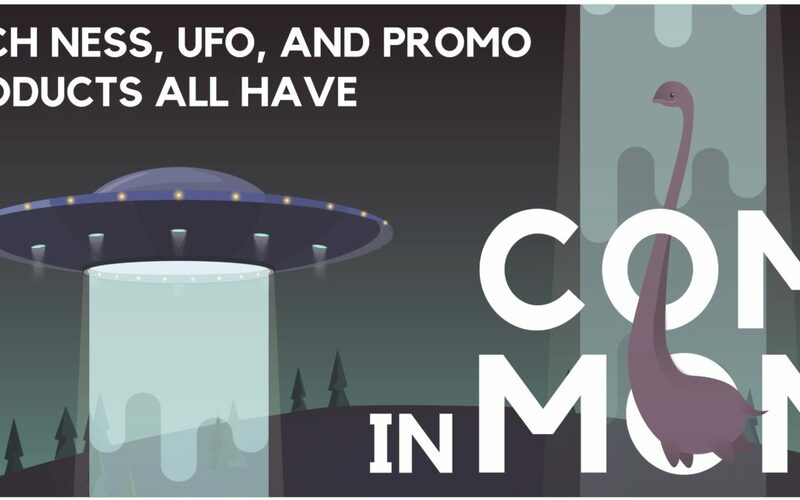 “How can the Loch Ness monster, UFO’s and Promotional Products have ANYTHING in common”, you ask? I would answer that question this way – they are all shrouded in myths and misconceptions. Take the Loch Ness monster for example. Long the subject of Scottish folklore, this “monster” has had a busy year, with more “official” sightings than any other year this century. Admittedly, the number of official sightings logged is eight, but that’s a lot for a mythical beast. Still, most scientists believe this monster is probably just a large aquatic akin to a whale. UFO’s have long had a loyal following of believers. UFO conspiracy theorists argue that various governments and politicians globally, most notably the officials of Washington, D.C., are suppressing evidence of extraterrestrial unidentified flying objects and alien visitors. All this, in spite of the fact that no tangible evidence of a UFO has ever been produced. Promotional products, too, have a long history that is shrouded in myths and misconceptions. Did you know that these products first appeared in the 1700’s with the production of presidential campaign buttons for George Washington? The best price in promotional products requires ordering from a large box store. While Staples, Amazon, and Walmart have their place in retail, don’t think they are your go-to source for the best pricing in promotional products. At Worrell, we are able to work directly with manufacturers for the best pricing. As an independent distributor, we may know of deals or discounts that the national chains can’t match. Ordering a mass quantity of one product can save money. The reality is, you don’t always know if a product is going to be well-received by recipients. And, breakage and obsolescence may make for wasteful spending in the end. An independent distributor can afford you the opportunity to purchase any amount in a just-in-time basis to try out new products. Promotional items are “throw-aways” in the end, so there’s no need to put a lot of thought into purchase decisions. The idea that a promotional product has a short life with a recipient is relative to the perceived value they place on the item. Surveys show that many products are retained years after being received. If the product makes a connection with the recipient through a memorable experience, association with a brand they like or has a perception of high value, it will be retained for a long time. The key is to understand your audience and what they perceive as value. Worrell has a huge inventory of products of varying material and quality. This enables a business to find something special, but within their budget. In the end, it’s the promotional budget that reflects how a business chooses to brand itself. Waiting till the last minute to order can result in problems. Procrastination can result in being limited in ordering the exact number needed, in the right color and at the right price you desire. In addition, a rush order may result in higher pricing per item, affecting the original budget planned for the purchase. I should order fewer items than I really need, since some people won’t take them. It’s always been our experience that companies give away more of their promotional products than they expected. They go quickly. And, they disappear fast when the product is one the recipient finds especially attractive. At Worrell, we have many years of experience assisting small businesses develop the perfect mix of promotional products that match their customer base. Put your trust in us to promote your company brand with our large selection of products.